We all know/believe that as we approach the speed of light, time will become infinite and we may not be able to reach the speed of light. In other words nothing can travel faster than the speed of light. But in our last blog, Time Machine will remain fiction forever, we have expected to understand time better at infinity or near speed of light with the Teleportation and it’s timeline example. Let us try to understand with some examples the results of traveling at speeds near speed of light, at speed of light and beyond the speed of light. We have seen in the previous blog that one second of earth’s time can be equal to 1 minute or 1 hour or 1 year of another planet or vice versa. There is actually a formula to calculate the exact slowness of time (also called time dilation) known as Lotentz Transformation factor credited to dutch scientist Hendrik Lorentz.. We now know that time becomes slower and slower as we reach the speed of light. This formula uses the speed of the time traveler (‘v’ in below formula) to determine how slow his time will run. Here c is the speed of light and v is velocity of an object or Time Traveler. We usually consider the value of speed of light, c, equal to one, and change v proportionately, so that calculations becomes easier. For example if speed of light is 1, the ‘v’ would be 0.5 for half the speed of light, 0.9c would be 0.9 times speed of light. We see that when v = c or in other words both v and c are equal to one, the Lorentz factor becomes infinite. Though the time becomes infinite, we can actually calculate time dilation upto or very near the speed of light. 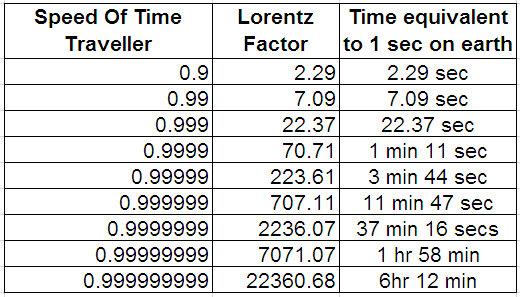 We have Lorenz transformation factor which we can use to calculate the factor of time dilation (how slow the time will become). I have calculated Lorentz transformation factor below for some values that we can consider as equal or near equal to the speed of light. In the above table, we can see that when the speed of time traveler is 0.9 times the speed of light his clock will run 2.3 times slow than that on earth, i.e earth’s 1sec = time traveler’s 2.3sec. Similarly we can keep on adding 9 at the end of that number to increase precision and actually calculate how slow the time traveler’s clock will run with respect to time on earth. We had all expected that the time will become slower and slower as we reach the speed of light and we may not actually reach the speed of light. But as we can see the amount of time dilation increases by only 3.16 times approx (time becomes slow by 3.16 times) as we keep on adding 9 to increase the precision. That means we can actually calculate the time dilation at the speed of light and time may not actually be infinite. There is one more reason why time dilation cannot continue to increase forever. Whenever we need to reach a number we reduce one from it and divide it. We will get a precision upto one less digit than the digits in that number. E.g. speed of light is 2,99,792 km/s (6 digits). To get a number very near to that number we reduce 1 from that number and divide it by the number. We get only five 9s after the decimal and six 9s can be considered being reached that number and any more 9s are unnecessary. When we again look at the chart we can see that at six 9s in the precision we only get 11min47sec of time dilation i.e 1sec of earth time will be equal to 12 minutes approx. of the time traveler. That means if nothing can travel faster than the speed of light except light itself, then there cannot be time dilation more than 12 minutes anywhere in the Universe or it is possible to travel faster than light. That also means that the e.g. of Time Traveler in last blog where earth’s 1sec = Time Traveler’s 1 hr is not really possible! (It would be 1 hour, if we considered speed of light in meter/second or even more with different units). But what if the Time Traveler is traveling beyond the speed of light itself? As we have seen above, Lorentz transformation factor is based on the speed of light and anything beyond speed of light or at speed of light cannot be handled by this formula. So we can’t just keep on increasing precision! Instead we can try and understand our universe directly with the time dilation example used in previous blog irrespective of speed of Time Traveler. I would once again like to thank Sir Larry Randles Lagerstrom, for the online course “Understanding Einstein and Special Theory of Relativity” on coursera.org, without which I could not have understood Lorentz Transformation and other aspects related to Time and Special Theory of Relativity. I have not yet completely understood the whole course, I keep watching the video lectures to better understand it. ← Will Time Machine remain fiction forever?